Dumfries prison serves the local courts of Dumfries and Galloway. It holds up to 80 male offenders who are remanded in custody for trial and those convicted but remanded for reports. Short‑term convicted male offenders may be retained at Dumfries or transferred to another establishment according to their length of sentence and the availability of spaces. 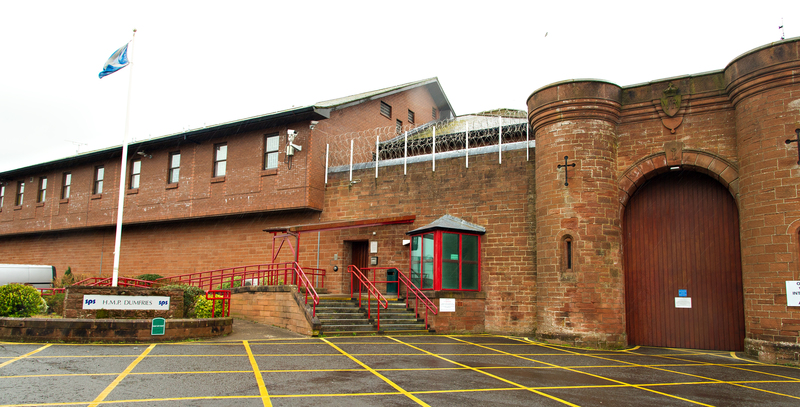 Dumfries prison also provides a national mainstream facility for holding up to 100 long‑term and short‑term offenders who require to be separated from mainstream offenders because of the nature of their offence, termed as offence related protection offenders. Built in 1863 as a local prison to serve the catchment area of South West Scotland, in 1951 it was converted for use as a borstal and in 1965 was changed to a Young Offenders Institution. The prison sits within the town of Dumfries. Dumfries sits five minutes from the A75, A76 and A701 and approximately 18 miles from the M74. Follow the road signs for Dumfries until you reach the Garroch Roundabout, where the new hospital will be sited, take the first exit sign posted Carlisle / Dumfries. Prior to traffic signals take left hand turn on to Terregles Street (speed bumps). Take third exit left, signpost for HM Prison sits at the bottom, visitors car park is to your right. Disabled visitors can park next to the prison main gates, space marked for disabled parking. There is also a ramp and rail supports as aids next to the parking space. Leave A74 sign posted for Moffat/Dumfries; continue on the A701 sign posted for Dumfries. Approximate distance 18 miles. Stay on this road as you enter Dumfries, you will pass Gates Rubber Factory, and a Tesco Filling Station on your left hand side, at the roundabout head straight across and continue until you come to a large roundabout, which is the A75 Dumfries bypass. At the A75 roundabout turn right heading towards Stranraer, continue along this bypass until you come to a roundabout over which sits a tall bridge, and take the second left sign posted for Dumfries Town Centre. Proceed through the first roundabout (Tesco will be on your right hand side), until you come to the next roundabout. Turn right at this roundabout; continue through a mini roundabout, Queen of the South Arena will be on your left, until you come to the next mini roundabout, which is on Terregles Street. At this roundabout turn left and follow the road, you will see a football stadium on your left hand side. Continue for fifty metres and you will see the signpost for the prison on the right hand side. Visitors have to park in the visitor’s car park. Disabled visitors can park next to the prison main gates, space marked for disabled parking. There is also a ramp and rail supports as aids next to the parking space. Once into Residential area follow the road until you reach roundabout, McDonalds sits to your right. Continue straight across. Proceed through the first roundabout (Tesco will be on your right hand side ), until you come to the next roundabout. At this roundabout turn left. We have two processes at Dumfries for booking visits. Please contact 01387 261218, select ext 205 from the choice menu, or press one. If you are not listed as a visitor, staff will contact the individual concerned to seek permission to add you and your friends on his list. Visits should be booked 24 hours in advance. Please contact 01387 274611, select ext 611 from the choice menu or hold for assistance. Contact 01387 261218, select ext 205 from the choice menu or hold for assistance. Visitors attending the prison for a visit should ensure they arrive at the vestibule at least 15 minutes prior to the start of the visit. No one arriving thereafter is guaranteed entry to the visits. You will first enter the vestibule area, the front desk is to your left. You will be required to present your identification to staff. The vestibule area provides lockers for any belongings you are not permitted to take into the establishment. You will be provided with a key, which you will hand back in exchange for your belongings at the end of the visit session. All visitors will be asked to walk through a metal detector and given a rub down search by a member of staff. At times, there may be the SPS Dog Unit operating at the visits, it is nothing to worry about and you will be given instructions by the staff. If you have any concerns at all, please talk to a member of staff. There are toilet facilities available in the visit waiting Area. Once in the visit room visitors will be asked to take a seat and the offenders will then be brought in. You will be made aware five minutes prior to the end of the session and at the end of the session, offenders will leave first and then visitors will be asked to exit. 'Friends of Dumfries' operate a small café, with limited stock, selling tea, coffee, sandwiches, crisps and sweets. There is a disabled toilet, which includes baby changing facilities. The visits room is equipped with toys and games as well as a children’s soft play area. The soft play area is for children 0-5 or less than 1.20 metres; this area is not supervised and is the responsibility of the parents to ensure their child’s safety. All property to be handed in must be accompanied by a Reception Pro-forma, the visitor simply hands in the property with the required Pro-forma at the Vestibule. The Vestibule officer checks that the items being handed in match the Proform and writes a receipt for the visitor as proof of receiving the items. Property can be handed in any time between 6.30am and 9.00pm. Items will be posted and will enclose the Reception Proform, the package should be marked with the Prisoners Name and Prison Number and where possible the senders details. On receipt the Reception Officer will mark the items on the property card in the presence of the prisoner and the prisoner will sign the property card to confirm it is correct. Only items that are listed on the Proform and on the articles in use list will be allowed in use. Money should be handed in to the Vestibule. The person handing in cash or cheques will inform the Vestibule Officer how much money they wish to hand in and for which prisoner. The specified amount is placed in the cash box and a receipt detailing the Visitors names, Prisoner name and number and the amount of money received is written and signed by the Vestibule Officer. The details are also noted through a logbook within the vestibule. Money can be handed in any time between 6.30am and 9.00pm. We recommend sending any monetary items in the post by Recorded Delivery, although this will be costly it ensures that the risk of loss is reduced. The envelope should be marked with the Prisoners Name and Prison Number, and if possible senders details. All letters received are opened in the presence of the prisoner. If the letter contains money the prisoner is shown how much. However it is strongly recommended that you send a cheque. The prisoner is then asked to provide the senders details – name and address. A receipt detailing the sender information, prisoner name and number and the amount received is written and signed by the Prisoner Management Officer. A log is also kept on each gallery detailing all transactions.